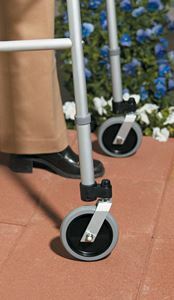 Caster Footpiece set (5") by Medline is the front wheel attachment of the walker. These attachments helps the walkers to proceed smoothly even on the uneven surfaces. Wheel atachments has to be used only on the front side of the walker. Can be chosen from 3" or 5" wheels.